Slammy B and the Electric Snakes at the Ritz: Atlas Zack on vocals, Silas Abrams on drums, Sam Benjamin on bass, (not shown Emmett Athearn on guitar). 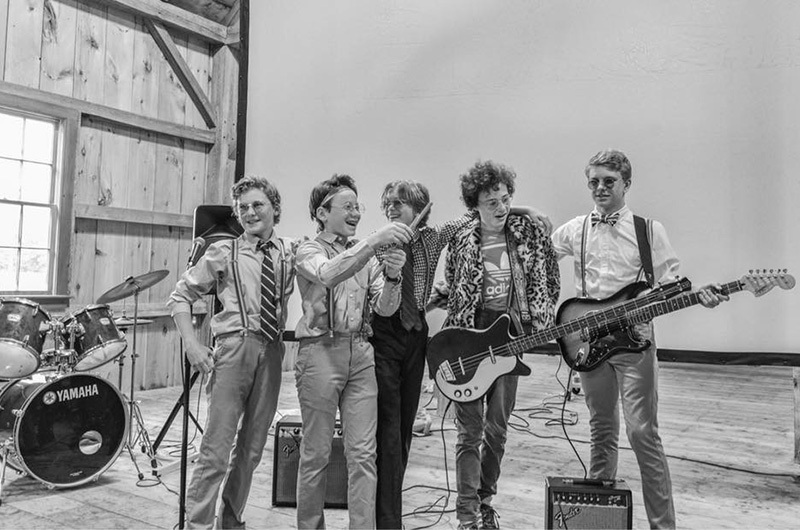 Slammy B and the Electric Snakes made their public debut in late June at their West Tisbury School eighth grade graduation. Not the after party but the graduation ceremony itself, where young Owen DiBiaso pounded the cowbell so hard the instrument went from ironic to essential in just a few minutes. 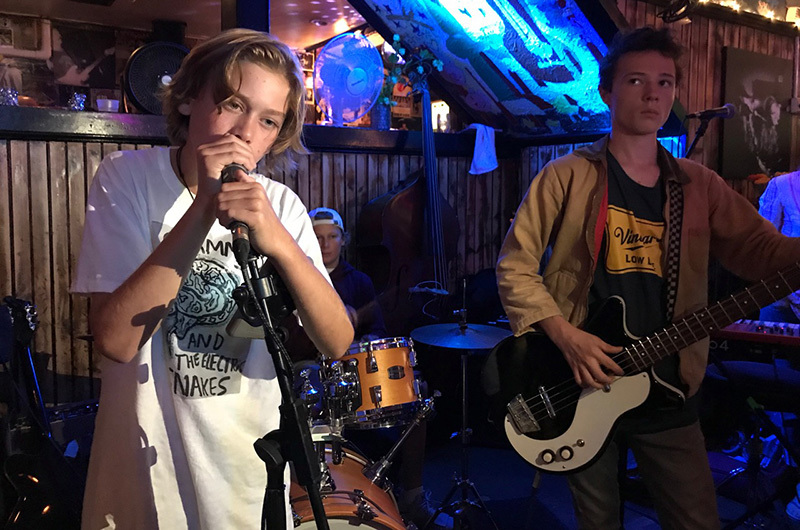 After some practice this summer to increase their repertoire from two Nirvana numbers to a nine-song setlist for the Agricultural Fair, they hit the streets and bars. On Tuesday they rocked the Dock Dance and on Thursday performed a show at the Ritz, defying expectations and age limits when they strutted into the bar and instead of being tossed out started tuning up. 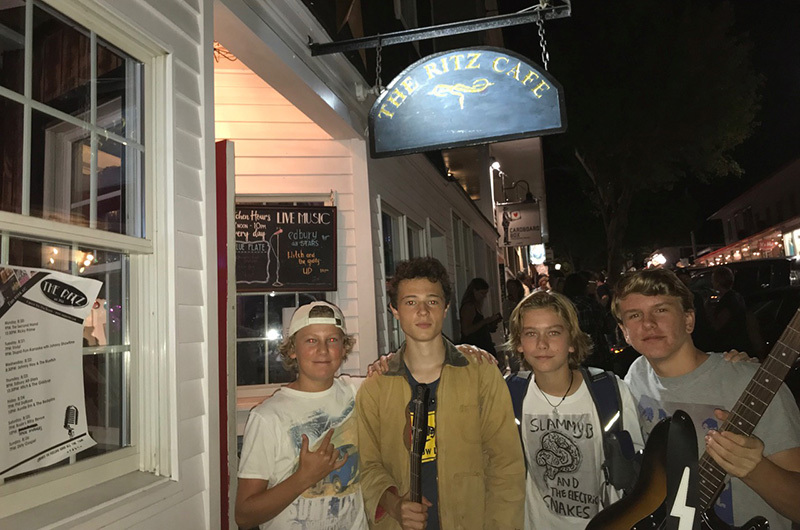 The current iteration of the band includes Atlas Zack, Silas Abrams, Emmett Athearn and Sam Benjamin, all rising high school freshman who cut their teeth in the orchestra room of the West Tisbury School. Owen didn’t make the recent gigs, but hey that’s rock and roll. On Thursday evening, Brian Athearn, father of Emmett, approached Atlas, Silas and Sam as they chatted before their set. Brian shrugged and smiled. “Welcome to the Athearn world,” he said. Emmett did show up a few minutes later, just as Mike Benjamin, Sam’s dad, was about to introduce the band. Mike had been performing with the Marotta brothers that night and they were making way for the next generation. Atlas Zack carries the weight of the front man on his slender shoulders. His mother Patricia Bacon was in the audience, looking around the bar in fascination. “It’s my first time ever at the Ritz,” she said. Other parents and relatives looked a bit more comfortable, some performing elaborate handshakes with the bouncer. The group rolled into All Along the Watchtower, with Emmett crushing the lead guitar riffs. He plays with precision but also a wandering eye. When asked about this after the show he admitted to watching a bit of the Red Sox game on the television above the bar in between licks. Emmett's journey on the electric guitar has been for the most part self-taught. “I watch YouTube videos,” he said. The group eased into Californication by the Red Hot Chili Peppers, then Come Together by the Beatles, with Sam Benjamin laying down the heavy bass line. Sam has been a driving force behind creating the band. He and Emmett were in art class together when they decided to start jamming. “But we needed a singer and a drummer,” Sam said. They went looking and found Silas and Atlas nearby. Sam’s dad Mike plays somewhere on the Island nearly every night of the week in one of his many bands, and Sam said he has been good with advice. The boys have been practicing a lot this summer and it showed. Parents and relatives including Silas’s six-year-old cousin Hazel, dancing down in front, presumably enjoying her first encounter with the Ritz, made up a sizable cheering section. But equally as large in numbers were the vocal strangers, barflies and some dude named Danny who screamed the loudest from his perch by the taps. Newcomers kept streaming in to see what all the fuss was about, then looked wide-eyed at the stage perhaps wondering if they had stumbled upon a playdate that had gone on too late. They quickly realized otherwise as Atlas and the boys let loose with Seven Nation Army by the White Stripes. The crowd was filled with older rockers from all over the Vineyard, including Willy Mason and John Stanwood, the guitarist for the Dock Dance Band. Stanwood said the boys crushed their show on Tuesday, and that they also revealed the smarts of seasoned veterans. 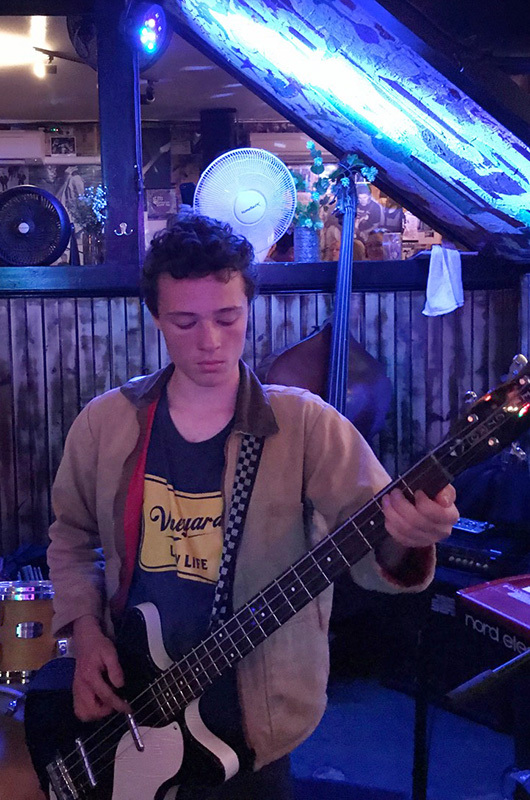 “They checked out the scene and when they saw it wasn’t crowded yet they said we could keep playing until more people showed up,” Stanwood said. And when the crowd did show up? After the show at the Ritz, the band did have to leave the bar; they still have nearly a decade before they are legal. And so where does the next generation of rock stars go to ease the adrenalin rush of a live show? Ice cream of course. While seated at Mad Martha’s, the group pondered its next step, the immediate future a bit cloudy as Sam Benjamin heads off this week to boarding school. And yet they still had their heads in the game, along with their wallets, already conscious of where the real money is made on the Vineyard music scene. “Anyone know somebody getting married?” Silas asked the group. I love this. Reminds me of when I was a youngster on the Vineyard music scene, how supportive, nurturing, and fun it was. Anything went and we had a blast. They were, indeed, the days. I'm thrilled that the young scene is still alive and thriving on the island, that there's a new era of "good old days" being made as we speak. We've produced some legendary cats over the years. You've got a proud tradition to uphold...keep it up, lads! Rock on. Great paper, Great pics, Great music.